Place : Jodhpur in the north Indian state of Rajasthan. Popular As : Largest and grandest private residences in the world. Location : 3 kms. from Airport, 5 kms. from Railway Station, 3 kms. from Bus Stand. 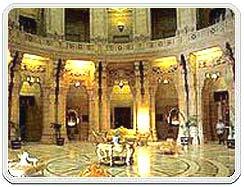 Umaid Bhawan Palace is one palace that combines architectural extravaganza with aesthetic triumph. To believe it you have to experience it. Maharaja Umaid Singh conceived the Palace as the centerpiece of his massive famine-relief scheme. The distinguished designs of Henry Lanchester for Cardiff City Hall and Law Courts/Central Hall, Westminster, impressed Maharaja Umaid Singh, and Lutyen's protege was commissioned for the job. 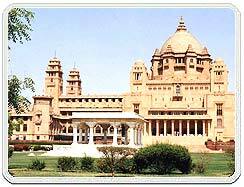 In 1977, Umaid Bhawan Palace was converted into one of India's grandest luxury hotel. Now a heritage hotel/ museum and residence of the royal family it boasts of 300 rooms, theatre, eight dining rooms, banquet hall, ballroom and an indoor swimming pool. Air : Jodhpur has its own airport that links it with major tourist destinations of India like Delhi, Mumbai, Udaipur and Jaipur. Rail : The railway network connects Jodhpur with Delhi, Jaipur, Ahmedabad and Lucknow. Road : Jodhpur can be easily reached by road as well. There are well-maintained roads linking it to tourism destinations like Delhi (597 km), Udaipur (260 km) and Jaipur (336 km).